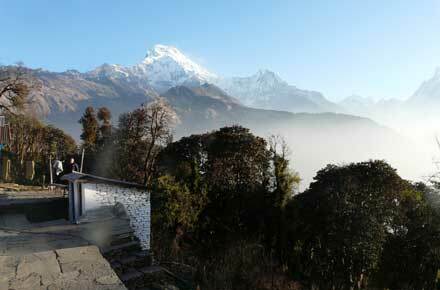 Trek up this famously beautiful and dramatic (if overwalked) Himalayan valley to the astounding Annapurna Sanctuary. Up by the Annapurna base camp, you will be surrounded by some of the most beautiful mountains on earth, including the four Annapurnas (8,091m downward). 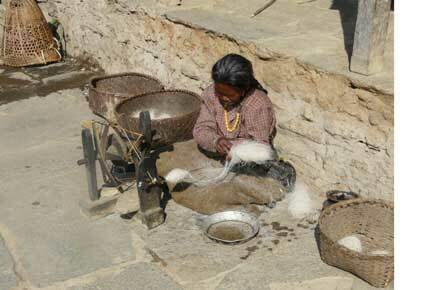 See the Nepalese mountain way of life - albeit inevitably affected by a high traffic of foreigners. 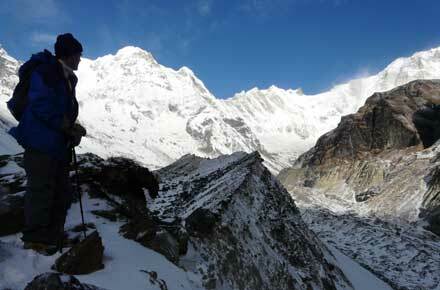 A justly famous trek, which brings its price: a popular route, with a lot of other trekkers in high season. The local culture and environment have been affected. 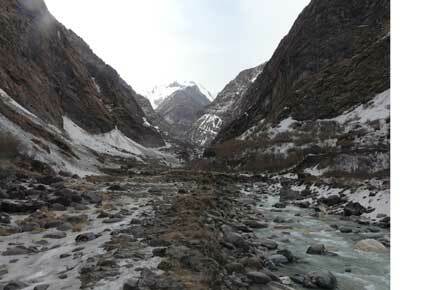 This is a tough walk in high mountains, on which you will have to be self-sufficient (but can "teahouse trek") and where altitude can cause real problems. Come prepared. See Walkopedia friend Richard Winter's account of this walk below. Good zizz, lovely dawn, first veggy breakfast, met my guide, Chongba, and my porter VJ at 8 a.m. After much soul searching shed some weight - small boots and smart gear. Bought better sun hat and water bottle. Rough car up to Birethanti. Same road I last saw 20 years back under construction, now destructed. Beautiful climb up with glimpses of Fish Tail Mountain. 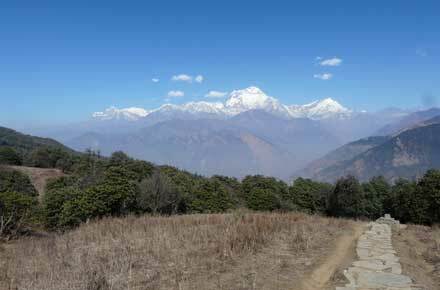 Started trek close to Birethanti – 10:25 a.m. checked into Park (Trekking Permit and entry pass). Two hours gentle shake-down to Subanic (1350 METRES) for mixed veg spring rolls + ginger tea : yummy. Passing:Donkey trains, Sirdhar’s, kids kids kids in immaculate uniforms, trekkers, formally dressed wives; all friendly and healthy looking. Meandering holy cows, soaring birds of prey, and constant rush of mountain streams cascading to the plains. Chongba walks a few steps behind (which might become irritating?) and VJ further back. Wearing walking trous, polo shirts, high tech socks, inner wooly pair for friction and carrying: sticks* (2), Water (2 litres/day), money, guide book, kagoole, light fleece, diary, specs, pen, spare shoe lace, whistle. Tomorrow I will dump the kagoole, and take some snacks + first aid. (But standard of fodder so far very high). 6:30 p.m. Down to Dining Room, wood fire with host family, VJ and Chongba and 75+ Grannie huddled around. Ordered onion soup and mixed veg macaroni. Still only guest, if this continues I may struggle for stimulation. 7:30 a.m. Late start, climbing steadily through Hobbit style countryside. Tried to keep pace slow and even, but surprised how slightly breathless/dizzy. Only 2,400m, so probably getting my trekking legs. 11:30 a.m. After losing height through an enchanted wood with glimpses of Himalaya to left, lunched in a weird Tibetan Village – ate mixed rolls and drank lemon tea. 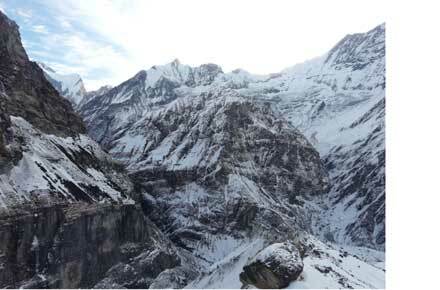 Feeling a tad woozy and tired – hope it passes before the haul up to Tarapani. It did! 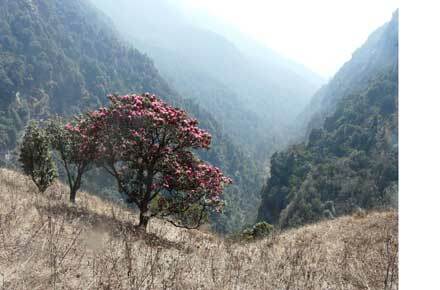 Very pleasant descent, capped by best yet tea stop in bijou location with extensive views to Fish Tail and Nhigiri. Sting in tail last half hour but slow pace and swing step worked a treat. VJ secured a reasonable location, but noisy so far (beside the wooden stair). Fell in with an Israeli + 23 year old daughter* who typically I’ve found are worldly and a good laugh. Arranged to dine together later. * High hopes she’ll fix my IPOD. Dashed – she didn’t! But nice convivial evening: cards – chatter-warmed by wood stove under the tables. Bed at 8:30 p.m.
First time in new sleeping bag. Too warm! P.S. I cheated during night – awoke at 11 p.m. wide awake and fearing a night of “planning” – I popped a half tab. Refreshing sleep! The predictable bright dawn – fairly slow start with hot milk muesli and cheese omelette and hot chocolate. Byebyes to Manchurians heading to Gorapani, loose plans to meet Israeli’s and Exmouth Girls at Chongba. Impressed Thai lady with HKWVC Thai song. 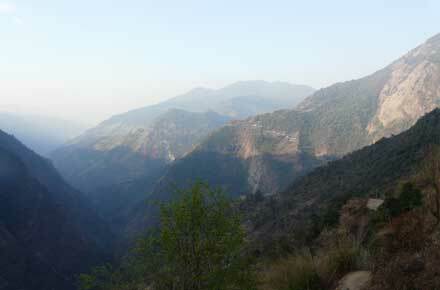 Easy down-valley start, with glimpses of height across river. Dramatic landfall, taking out ridge of hill – lucky houses survived either side. Bottom of valley dramatic rope-wire bridge with Hindu garlands in parallel to protect travellers. 10 a.m. first break for ginger tea – Chongba cut sugar cane – tasty. He has 7 brothers (all Sherpas!) and one sister (17) at School in Kathmandu. 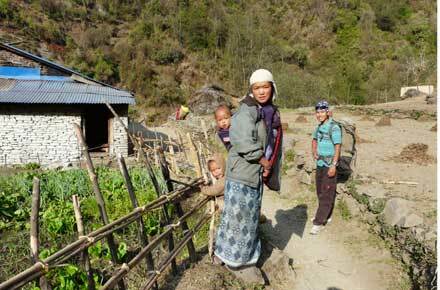 His father ex Sherpa now runs a full service farm. 12 noon. 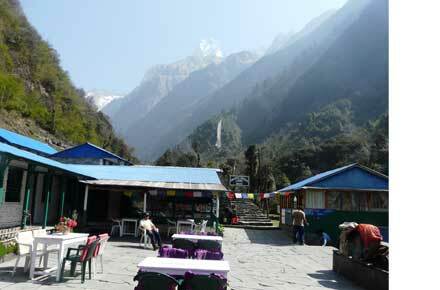 Lunch at Chhomrong (2170) Supposed to be overnight but Chongba prefers to head higher for acclimatization. Stopped at well stocked hotel run by ex British Ghurkha – been living on pension (UK) for 40 years! Met up with interesting German couple, who were at Tarapani, and initially distant French couple (Actually Finish). Spent the rest hours teaching the lads Cantonese! Mustard keen and very quick to learn – I’m still trying after 23 years. 6:30 p.m. Japanese guests disappeared – where? Holly and Simone (German couple) arrived. Great meal of mixed veg soup then mixed pizza. After good crack including from group of Oxford Uni Medic students, bound for climbing a mountain 6000m – seems inappropriate! 9:30 p.m. Bed – late! 6:30 a.m. Clear view of peaks. Breakfast of apple porridge and honey pancake. The English doctors subdued. South Koreans cold, Germans in fine form. 8 a.m. Headed off through woodland, dropping (yuk) down to river. 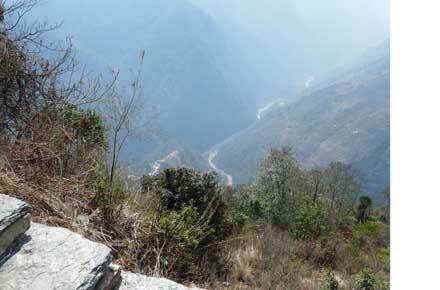 First leech, songs of Nepal on flute drifting up valley. Ginger tea small pot, at Bamboo Lodge. Soon joined by Germans and South Koreans. 12 noon Himalayan Lodge (2990m) Egg veg omelette. Met up with French/Finnish couple from yesterday, and got gozz from Japanese guy, straight from Annapurna Base Camp (ABC). Avalanch – cold - the lot. His US fluzzy was less impressed. Started clouding in at 1 p.m. – hoping rain holds off. 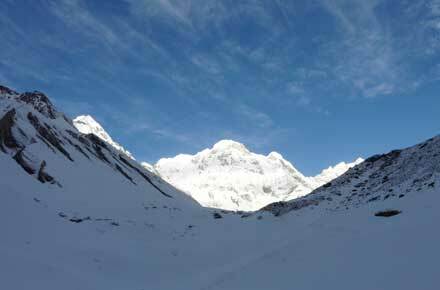 Arrived Duelliri (3200) around 3 p.m. Porters choice – I’m suspicious as no hot water, showers or light! But joy – the IPOD decided to work! Lovely hour listening to my favourites on the noise cancellation phones. A Geordie (Darlington) and his son in law turned up. Son, who had been ill, rarely appeared. The Geordie (62-Ex Fireman) was a music freak, so Holly and Simone (the Hoover) and moi had a nice evening in the cosy common (very) room. Early start 5:45 a.m. but slow off 6:45 a.m. waiting for boiled water. Had to circuit around an ice fall – steady climb in increasingly deep snow to MBC. Spectacular setting but clouds concealed the Peaks. Checked in bags and seemingly good room. Half Pot of Ginger, then headed up to our final destination. A steady plough through narrow cleared track, feeling the pressure in head now – but no headache. Arrived ABC around 12 noon. Pretty wild with driving snow and cold (4130m). Peaks still in cloud. Walked around the moonscape lake prayer flags and gravestones. Lunched with a bunch of English and Germans playing a weird travel game. Veg curry and Masala tea. Wild as hell outside and wondering if we’ll make the descent! But we did – with glimpses of Fish Tail through swirling clouds. Much easier going down. Back to MBC at 3 p.m. for cup of masala tea. Quoted 4 hours for camera battery charge for R400! Only Holly and Simone staying here – Heard about Mustang. 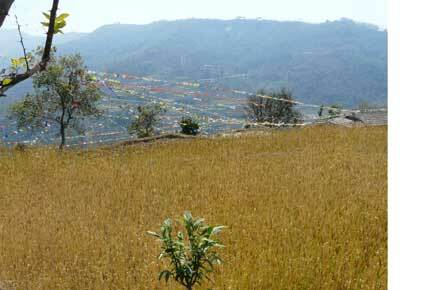 Diamond Way Buddhist Centre Kathmandu@diamondway-centre.org 14 days trip-teahousing etc. But high at 5000 mts. Next time perhaps? 6 p.m. Cold! So decided to pay for heater @100R each – not sure how system works, but certainly improves the ambiance. Delicious mixed pizza + Tubory Beer. Mein Host Farmer lives at Chongba, only opens twice a year. Singing started, a song from each country – Scotland, Nepal, Germany, Bavaria, Wales, England (Beatles) and China. Bed at 9 p.m. Weather still foul. Up at 1 a.m. for a P, but clouds still down. Not Auger well for tomorrow views. Knock at 5:45 a.m. Why so early? Very cold – probably 0 – 5℃, but clear! Getting very ripe so risked a cold wash – almost got frostbite in fingers. Quick brekky of porridge, apples and honey, hot chocolate then rushed (too fast and got palpitations) to a view point half way to ABC. Spectacular views of all the biggies. What a climax to trip. Also a gathering of all the crowd for communal picture: The student doctors (still intent on Tent Peak!) Germans, Geordies, Finns. 8 a.m. Masala tea at MBC, farewell to mein host, then started long descent. Amazing how scenery changed from deep white snow, to black snow to slush to barren to the first Rhododendron in flower. Also the smells of exotic vegetation hit the senses, mixed with whiffs of wood smoke, hundreds of butterflies. In tandem the layers of clothing are shed as the fierce sun starts to penetrate the deep valleys. 12 noon Stopped at Dovan for lunch. Surprised to hear that I’d passed Holly and Simon. Quandery – should I wait at Bamboo for surety of a sociable evening, or crack on to Shinowa-Geordies will be there. But average accommodation at best. Ordered my first Dall Baat, the staple diet of every Nepalese it seems. In fact, Holly and Simone arrived, and we agreed that I would push onto Shinowa, reserve them a room and they would see how they fared. I did, with an easy 2 hour trek, arriving at 3:15 p.m. Hot shower, Masala tea and the best 3 bed, end room – paradise! But – even in the wilderness, social stresses still prevail. The Geordies tramped through without stopping, under the iron command of their guide – clearly attracted by an alternative honey pot. Next tramped the Finns with a casual hi. Finally the male Korean charged through with barely a side glance. So perhaps I’ll be on my tod. Sitting writing this outside my palatial room, on the veranda, surrounded by exotic bird song and flowers. But Paradise Tout Seul? 6:15 p.m. Went to Dining Room. Immediately fell in with interesting bunch of Flemish. Spoke widely about HK/ICAC (Philippines Democracy and the rest). Nice meal of Macaroni with Tuna and Cheese and Tomato Soup and Mint Tea. Finished White Tiger, quite an expose into Indian life. Interestingly, the Nepalis guide knew the book and thinks the author is Nepali born, living in Australia. Starting now to read “the Famished Road” by Ben Okri. * Reminiscent of John Sanderson’s treatment of the outsider in Philippines a few Xmas ago (Borocay). Hope I don’t head down that route. The Belgians finished their card game and headed straight off at 8:45 p.m. – no goodnights or eye contact – odd – had I offended them by not participating? Bed at 9 p.m. Gentle start at 7 a.m. with little sighting of the peaks. Lovely to be on the road again with steep fall then rise up to Chongdra, where I met up with the Geordies again over a Ginger Tea. Steep descent down to New Bridge. 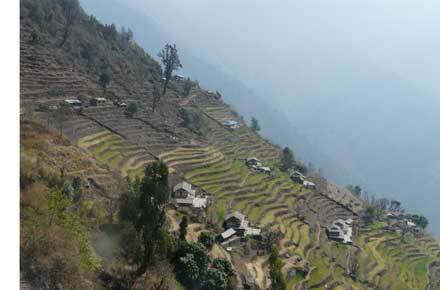 Spectacular countryside of small farms clinging to the terraces. Had lunch with both Finns and Geordies. 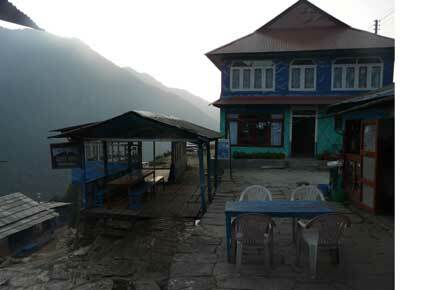 Decided to speed up and take in the Fish Tail lodge, if there is room, in Pokhara. Strode out at 12:30 on the left bank through deep Gorge countryside. Farming getting more prosperous as we descend. 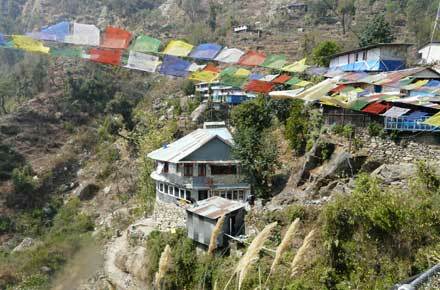 2 p.m. steep accents up to a cliff top village of Landruk. Pretty, but a weird atmosphere – faintly hostile – no smiling kids. Stopped for Masala tea at a dilapidated lodge. Chongba has now disappeared for some ten minutes – perhaps he’s been voodoo or making the tea himself? Strange how some villages appear brooding and slightly menacing – but most the complete opposite. 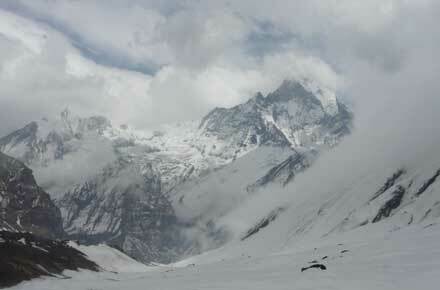 The mountain tops now completely cloud bound – we were certainly lucky with our ABC timing. 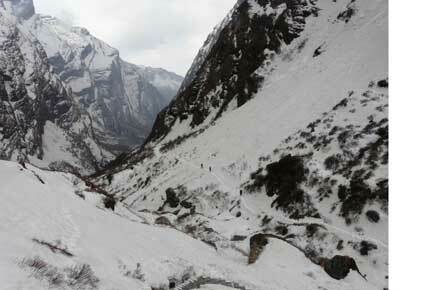 After steep climb up ‘Mint Valley’, arrived Tolk at 3 p.m. (not 4 p.m. per Chongba). Sun out again and glorious setting perched on hilltop. No one else here, so picked choice room, with vegetable garden behind, panoramic views in front. Cup of black tea, whilst fat cheerful manageress chatted away – about what? 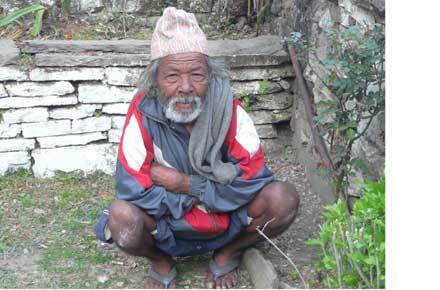 Ancient old man grinned and squatted – he’s not sure of his age, but thinks around 75. Carved out of granite. Happily coughing his guts out. On way two small costumed girls leapt out, dabbed my face with red holy spot and tried to give me a flower/spring of grass. Chongba sternly saw them off – apparently next step would have been a cash call. Unique form of begging. Also on route, a group of men clustered and noisy at a nearly farm. Apparently a Hindu religious ceremony, complete with chicken slaughter sacrifice. What makes one village seem gloomy and mildly sinister, the next welcoming and uplifting? Can it be leadership, or simply the sun shining? 3:45 p.m. Madame starts a lengthy soap wash right next to me. Something I’ve noticed the Sherpas being scrupulous about. Plenty of soap and cold water rubbed powerfully onto face, ears, hands and all exposed skin-fully clad of course. 4 p.m. Classic shower. Initially caput, the local plumber was summoned from a high glen. Meanwhile, Madame worked her magic and obtained a trickle alternating between scalding, cold and nothing. I braved on, risking full foam with only cold to disperse. After my standard brief zizz to the stains of Byrds (IPOD up to old tricks of sticking to one album) the new arrivals are the dreaded Koreans – no communication and loud. The least welcome of the many chance acquaintances. 6:15 p.m. The Koreans had stolen my reserved table – again. But the meal of tomato onion garlic soup, followed by pizza and bear, was superb. Worked on my new songs. Slightly apprehensive that no crisis when I get back to mobile contact tomorrow. 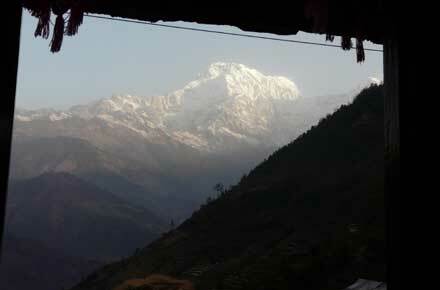 6 a.m. Clear views over the range, sumptuous breakfast of muesli-bananas-honey-hot milk, omelette, hot chocolate. 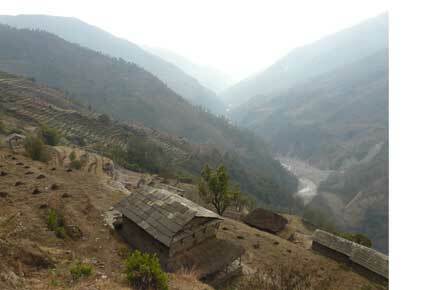 After photos of family cooking room, and old man, we left this charming village for our last day’s trek. A fairly steep climb up to Darelili (‘top of mountain’) then meandering path down through lush woodlands with the full panorama of mountain range to left, farmland to right. A ‘proper’ dog tagged along for some of the trek, intelligent, well kept and friendly – total opposite of Muggins. “Civilization” crept upon us – first with mobile contact, after 7 days radio silence. No messages from UK, but Betty – office seem OK.
More houses, schools and exhausted trekkers plodding up the hundreds of steps to Damphos. Getting very hot. Finally heard our first engine in the valley below – a tractor. 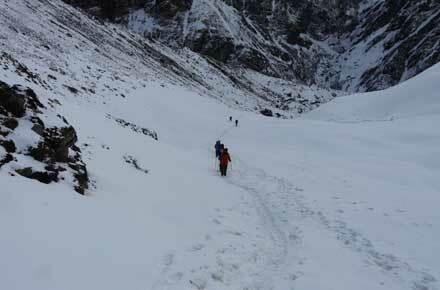 Lost height rapidly to reach Phedi – our destination. 3 Dal Bhaats, Sprites for the lads and mint tea for me.